There are five radioisotopes of copper that are suitable for use in nuclear imaging or targeted radionuclide therapy: copper-67, copper-64, copper-62, copper-61, and copper-60. The diverse nuclear properties of these radionuclides include half-lives ranging from 10 min to 62 h and decay pathways via positron (β+) and beta-minus (β−) emission. Single-photon emission computed tomography (SPECT) as well as radionuclide therapy can be performed using copper-67, while the quartet of other radioisotopes decays via positron emission for positron emission tomography (PET). 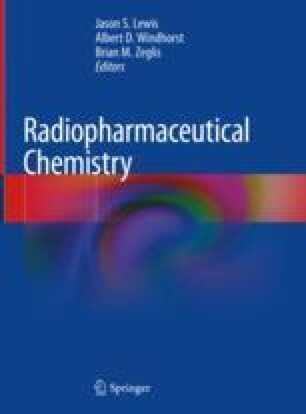 Two current foci of research into the radiopharmaceutical chemistry of copper are the creation of new coordination architectures for the radiometal and the development of relatively simple radiolabeling techniques that will lead to agents that remain stable in vivo. This chapter will discuss the production of the various radionuclides, the development of chelators for copper(II), and the applications of copper radiopharmaceuticals in both imaging and therapy.